When I started on this sampler quilt, I knew that I wanted a true sampler and I was going to have to use a wide variety of techniques. For these next two blocks, that meant curved piecing. Very scary. 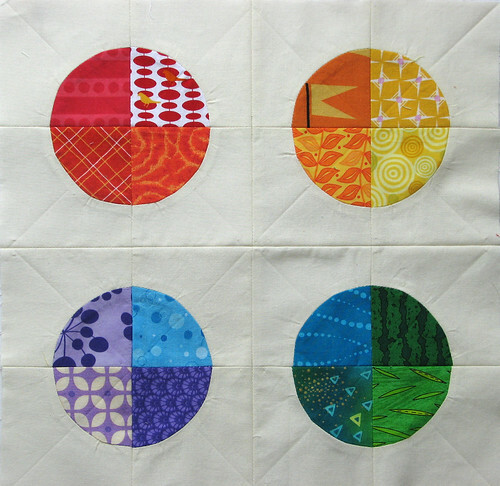 It is a lot easier to just cut out a circle and applique it, in my opinion. But then, it doesn’t lay nice and flat, like the curved piecing does. See what I mean? Those half circles are just all wonky. Not my favorite block. This entry was posted in Rainbow Quilt. Bookmark the permalink. 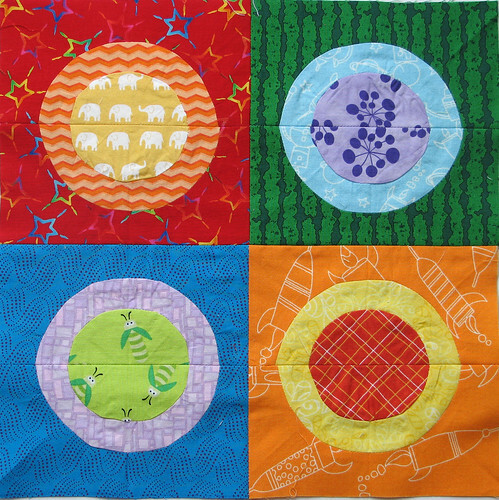 Oh, but your quarter circle block is fabulous! I’m enjoying your sampler quilt. Just made a block today inspired by one of your earlier blocks. I heart rainbows! Thank you! I love the rainbows, too. Obviously .